Thick, leathery gray legs covered with a layer of thick, wet, chocolate-colored dirt, surround me. At first, I am apprehensive. On all sides of me are six-ton elephants. Capable of plowing me over. 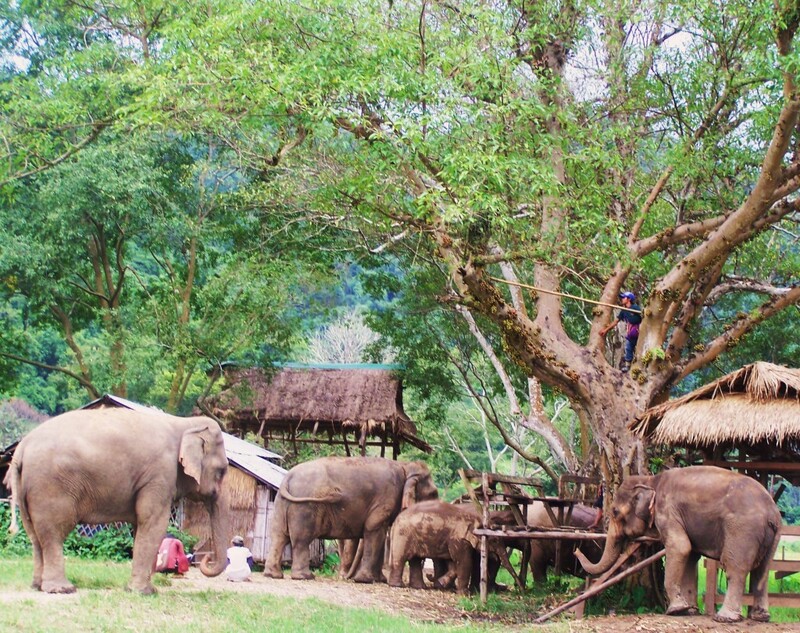 I look over to Lek, the founder of Elephant Nature Park, with my eyebrows raised. We’ve learned we’re not supposed to be in the path of these giants, and here I am. Not only keeping step with them, but flanked by them. In normal, volunteer park life, we are not part of the herd. But, this afternoon is special. Lek has invited Pam and I to walk with her through the elephant’s habitat, an experience most don’t have while here. 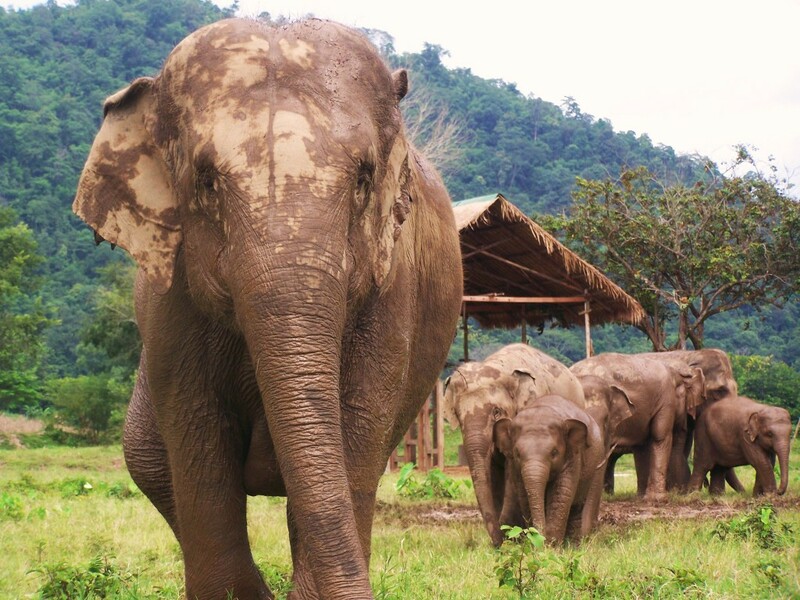 We’re shadowing Lek as she makes her afternoon rounds with the main elephant families. Two babies, loads of aunties, nanas and moms. The afternoon happened on a whim. “Do you want to come with me on my walk?” Lek asks Pam and me following a presentation she has given to our group about the atrocities of training elephants to pain. The two of us have hung back, discussing our frustrations with the tourists down the road riding elephants as we speak and trying to figure out how we can help educate visitors to Thailand set on enjoying these magnificent creatures. I look at Pam and our eyes light up. How in the world could we ever say no to such an opportunity to walk the park with Lek? My mind drifts back to the first time I saw Lek, earlier in the week. Under a thin mist of rain, she had walked out into the field and kept step with the Faa Mai, the pudgy baby elephant she’s bonded with. The two look like an odd-coupling, but behave like old friends out for an afternoon stroll. 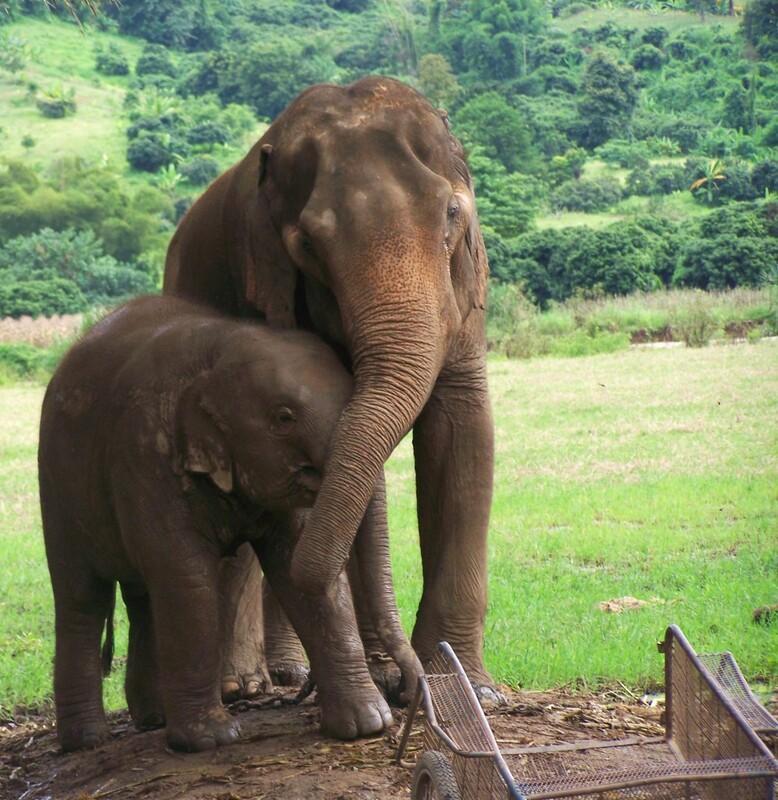 Lek and Faa Mai, the first baby to be born from the Elephant Nature Park herd. 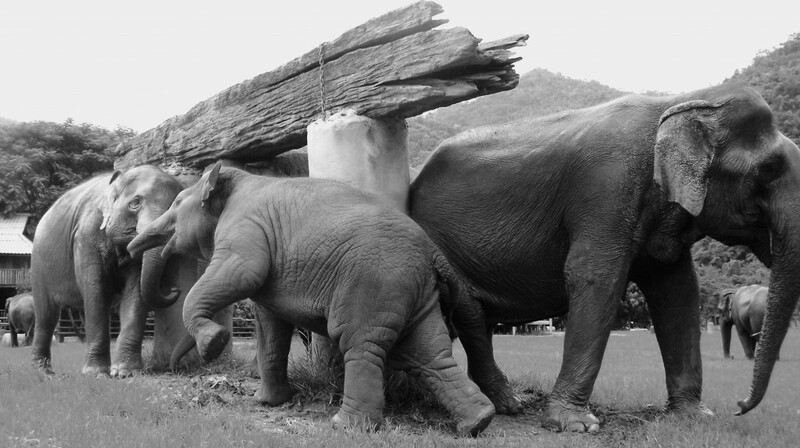 Lek walks with her hands on her hips, dwarfed by the baby, who reaches around to touch her with her trunk. Today, I get to witness the beauty of Lek’s friendship with these elephants first-hand. As we begin our journey into the elephant’s habitat, we’re trailed by about 10 dogs who are Lek’s shadows. It’s clear — these adopted dogs love Lek as much as the elephants love her. I follow after Lek the same way they do — hanging at her heels. My heart is full of admiration for a woman who is nearly single-handedly taking on the elephant tourism industry in a country where it is one of the biggest selling points. The families hang out under a tree, waiting for fruit. The three of us head out into the elephant’s habitat — a grassy field with thick brown puddles from the rainy season that is causing flooding in other parts of the country. We quietly stroll up to the family, which is snacking on fruit a mahout shakes from a tree. None of them are related, except mommies and children, but an entire make-shift family has blossomed. The beauty of elephants embracing the inherent structure of family and adapting to create their own. Pam and I stand back at first, unsure of what to do or how to behave. Jack’s warnings of standing in front of them echo in my mind, so I try to sidestep their bodies. But, with so many of them, it’s nearly impossible not to stand in front of one of them. Lek produces a bag of bread, and suddenly, we’re surrounded. Trunks come from every angle as they grapple for a piece of the fluffy snack. Talking to them softly and scratching their searching speckled trunks one-at-a-time, she delivers the pieces to them. Baby elephant Faa Mai and her family surround Lek. When the bread is gone, the three of us sit among the long blades of grass for awhile as Lek talks about the park. Then, we hear commotion from a mahout. 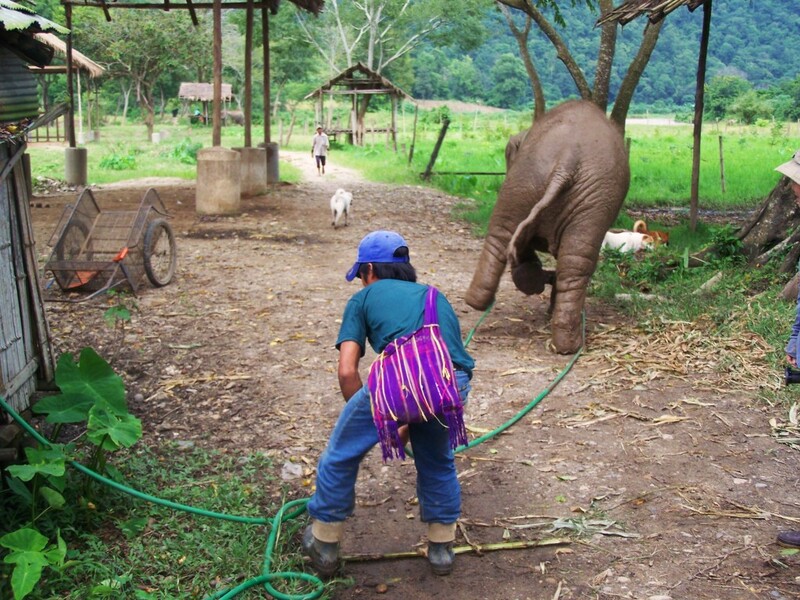 The baby elephant, Faa Mai, waddles away from her mahout, wrapped in the garden hose. One of the baby elephants is tangled in a green hose, as if she has taken it and spun in a circle, lacing it around her legs. 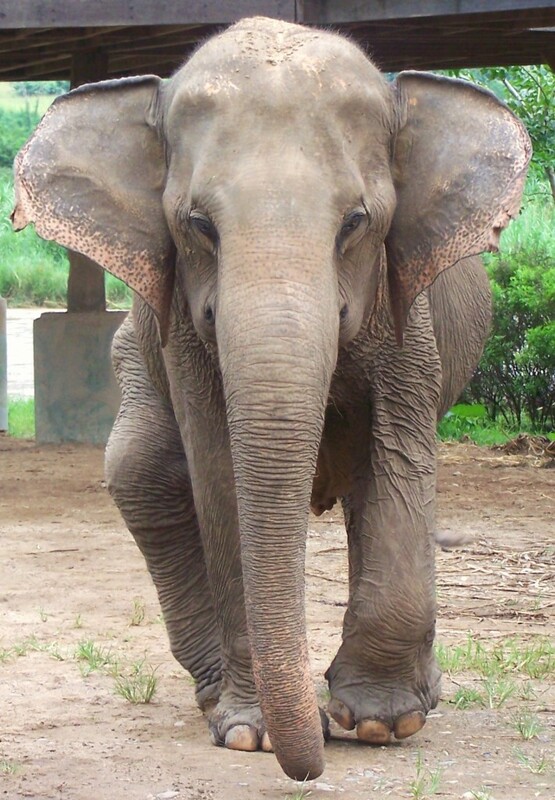 She waddles with it for a moment, playing, and then her trunk wraps around the part still attached to the house and pulls it from the spout, causing a slow trickle of water to hit the ground. I can only imagine, this is how a delighted and happy elephant looks as she speeds away from her owner. 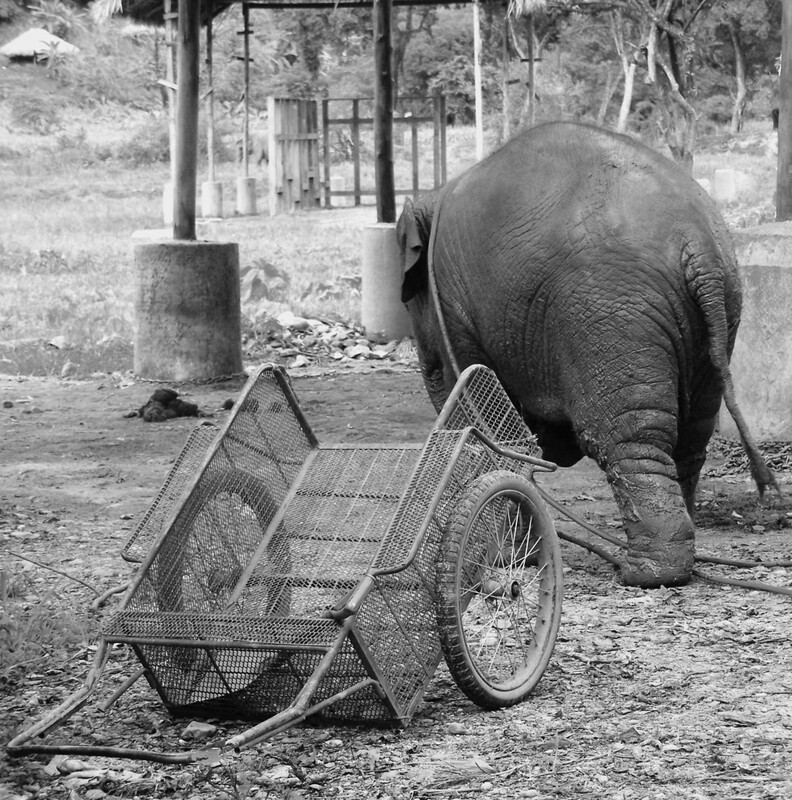 She waddles around for a moment, hose wrapped around her pudgy legs, before the mahout can sneak in and remove it from her body. Then, it’s bath time. The entire family heads to the banks of the rushing brown river. This is the moment we become a part of the family. The family begins its walk to the river bank. Looking around, in between legs, trunks swaying within centimeters of my hands, the gushes of wind from the flapping of the ears … it evokes this happiness I have never felt before. I can’t help but realize how incredibly lucky I am to be keeping step with these creatures. 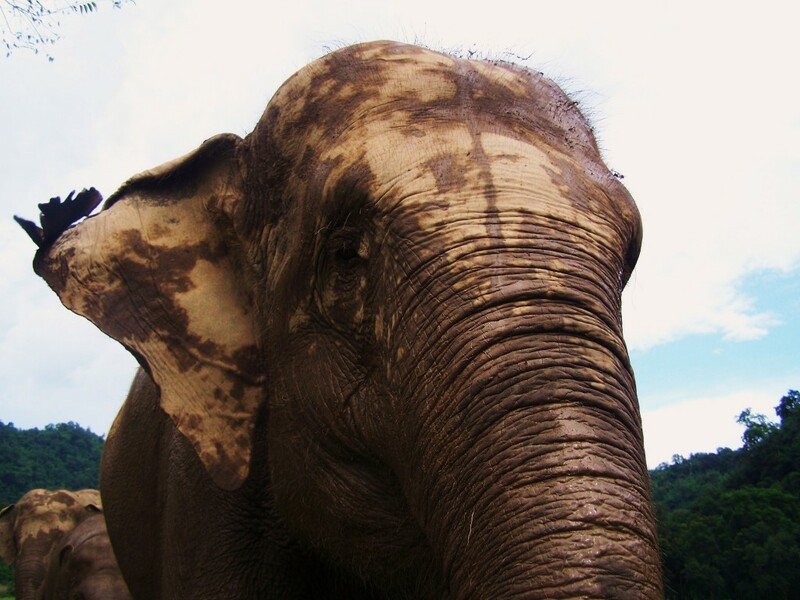 One dirty (and cool) elephant. In the moment, walking with the herd, I am incredibly fulfilled and it stretches from my toes to the tips of the hair on my head. This is, quite possibly, one of the most amazing moments of my life. Lek, Pam and I stand back a few feet as the family heads into the water to rinse off. 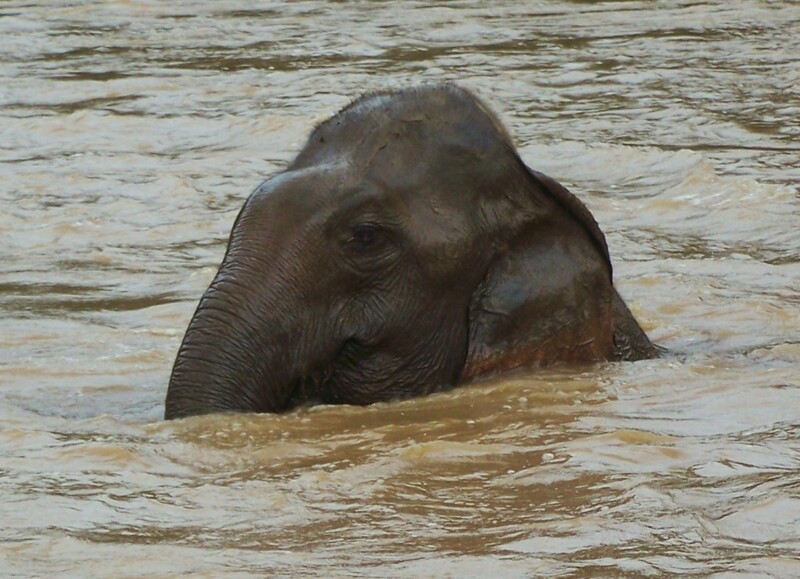 Some of the elephants wade out a bit and just stand in the water, letting it rush over them. Others seem to enjoy it more, plunging their heads and then entire bodies under the water and letting the current carry them down stream a little bit. An elephant enjoys the refreshing bath. And, of course, the babies play, splashing their trunks in the water. It’s not just bath time, it’s play time! Mommy and baby come out of the water, headed straight for us. Instinctively, Pam and I dart out of their path as they rumble past. A baby elephant plays as another leaves the water. “Where are they going?” I ask. As we turn to follow, their end point is obvious. The huge dirt hill a few feet away where a group of volunteers are digging and making sand bags for a sick elephant. The baby walks up to the truck where the rust-colored dirt is first, flinging a boot into the back of it. Then, she grabs dirt and sprays it on her. Lek and volunteers look on as elephants enjoy dirtying up again. Within minutes, the elephants are once again covered in dirt. They are laying in the pile. Rolling in it like dogs. Rolling in the mud keeps these elephants cool in the tropical heat and humidity. It’s one of the most adorable displays of animals enjoying themselves I have ever seen. 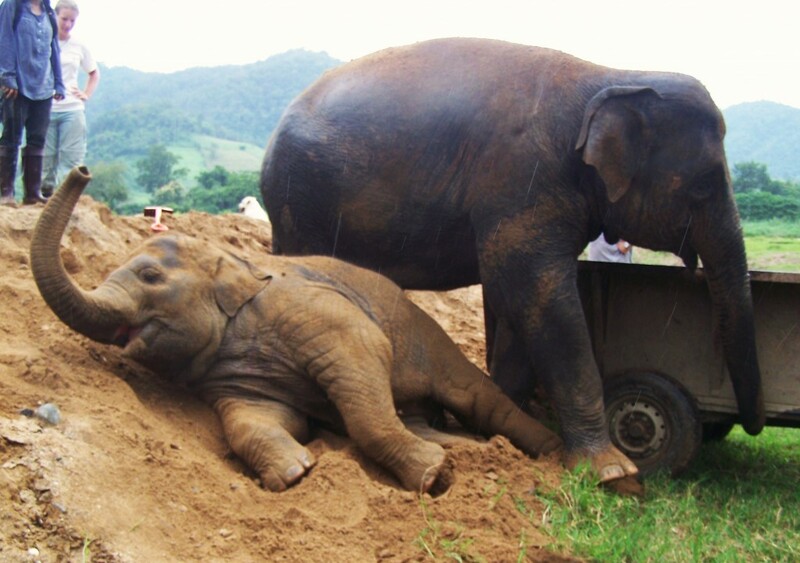 While one lays in the dirt, another elephant finds more to play with in the trailer. 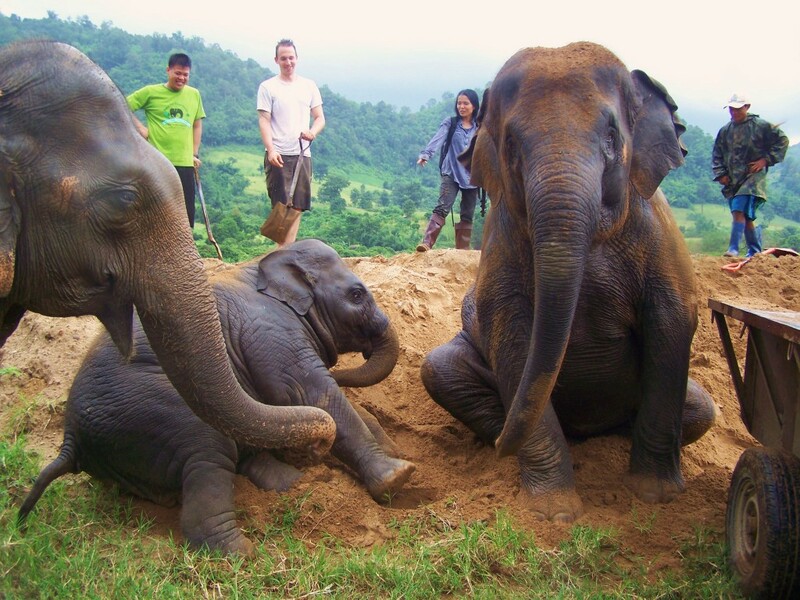 Rain doesn’t stop these elephants from enjoying the dirt pile. I almost feel guilty when Pam and I head off with Lek again, leaving the other volunteers to continue shoveling. But, as we walk with the herd, those feelings vanish and are replaced with one of the most exhilarating feelings of elation and bliss. This trip to Thailand is life-changing, there is no doubt. 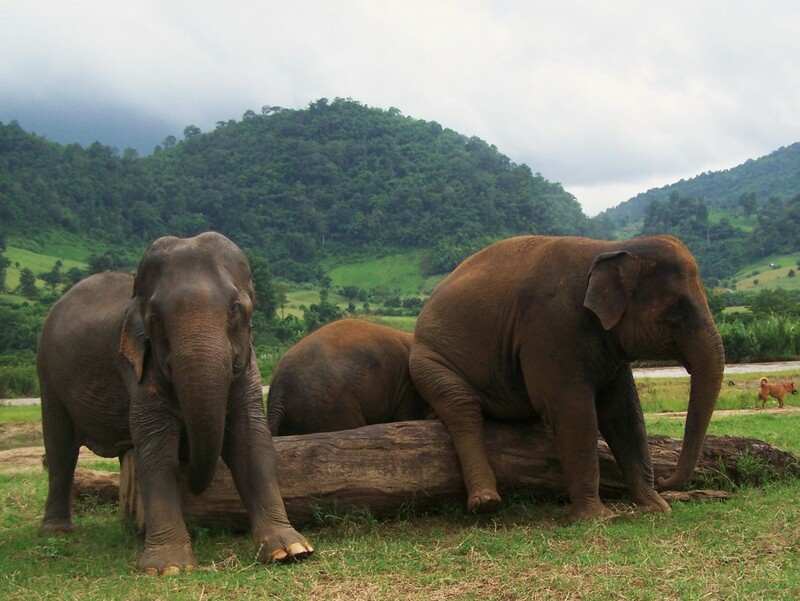 As we continue, and the elephants stop to scratch their now dirty bodies against posts and logs to get at itches. They find an old log to get those hard-to-scratch places. They slide their enormous bodies against the wood, back-and-forth, back-and-forth, until they move on to the next post, where they once again rub and scratch. 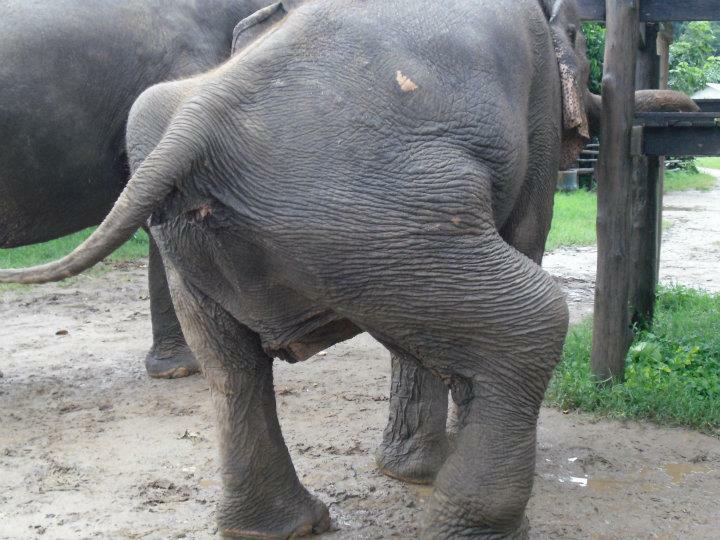 Elephants display satisfaction at quieting their itches. As we make our way back to the family shelter where all of the volunteers will meet to sit with Faa Mai as Lek sings her lullabies to for her afternoon siesta, we encounter Medo, in her 20s, and her best friend. She has been sadly disfigured from both logging and forced breeding injuries. At a young age, Medo was forced into illegal logging, and was the victim of a serious logging accident, breaking her right ankle badly. The bone was unable to set and today her ankle is enlarged and irregularly shaped. 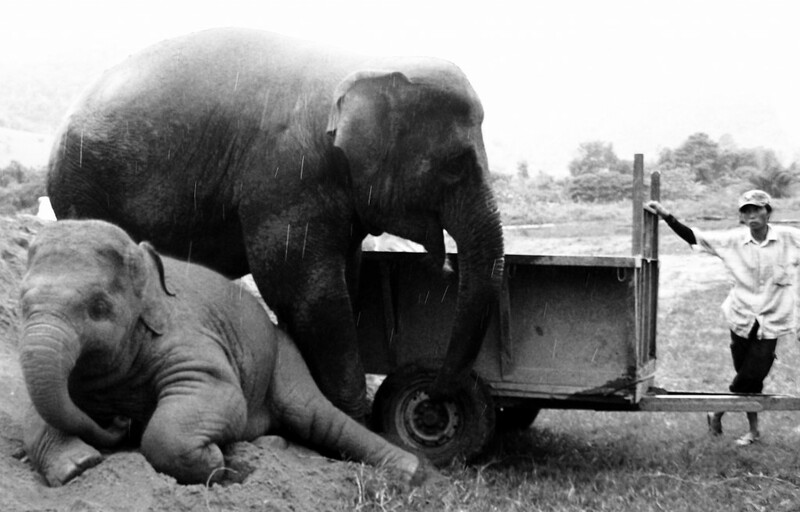 After this injury, she was unable to work in the industry and sold to a new owner as a breeding elephant. She was chained to a tree and a bull in musth was chained next to her. 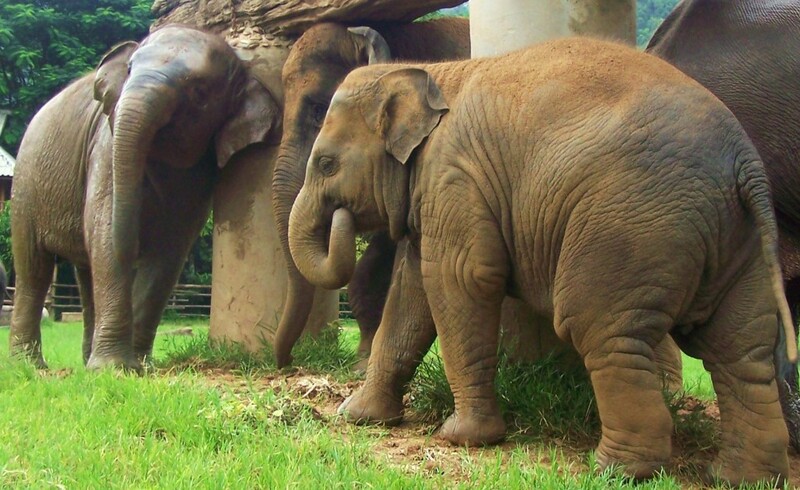 According to Elephant Nature Park, under normal conditions he might not have taken an interest in her, but in this case, he attacked her and mounted her. Medo collapsed under his aggression and laid there for two days, until the bull was able to be removed. But, the damage was already done. The teenage elephant had a dislocated spine and broken pelvis. Today, it is impossible to miss her gait and how she can hardly place weight on one of her legs. As we walk by Medo, I can’t take my eyes off of her. Her history and abuse run through my mind, and I smile, comforted by her being so close to me, knowing she is no longer going to face any harm. When we finish our walk, I return to my room, speechless, breathless. These are amazing!!! Omg they are so cute. The first photo is definitely my favorite. Thank you!! 🙂 I have hundreds of pics from the week! What magnificent creatures they are! They have absolutely captured my heart! Love your story and photos 🙂 Hopefully I can make it there one day. I haven’t heard of them, but thank you for the link! I will check it out! I hope you can make it there one day, too. It is an amazing experience. I don’t think anything I have written, any words, could truly do it justice. Best.post.ever! I love you for this post!!!!!!!!!!! 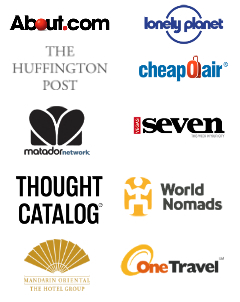 Oooh, new site design? LOVE it, almost as much as those amazing elephants. Definitely makes me wanna work with them myself. Yes, new design! Thank you, Candice!! You should spend a week there. It truly is one of those life-changing, memorable experiences. I’ll go with you!! Then, after a day of hard work and loving elephants, we can sit on the platform with a Chang beer! Gorgeous – in every sense! Thank you so much. I keep opening the page and just looking at the photos. I was so happy in that moment and love to relive it. Beautiful post! Beautifully written, and beautiful pictures. The Elephant Park and Lek are absolutely amazing – so happy that there are people like her who do such a great job helping abused elephants. Thank you, Dani! Writing it, posting the photos … made me so happy. I think Lek is one of the most phenomenal, inspirational women I have ever met. This is so cute! I love all the photos and what a beautiful story. Thank you! The whole afternoon was filled with cute. The elephants have such endearing personalities! Sally, thank you so much! I really appreciate you taking the time to comment. I am so excited for your trip next month. It will be truly amazing for you. I can’t wait to learn about your experience! The photos look almost surreal! I like that they elephants (and people) look like they are all having fun. Great shots. Thank you! The experience was really surreal. I never expected elephants to roll around in dirt, or to be a part of a herd. Just really cool experience. Oh wow, what a heartbreaking story about the female with the broken pelvis and ankle 😦 But it must have been so awesome to be around all those elephants! Your photos are great; it’s so fun to see them going about their business, playing, bathing. I’m totally jealous! Medo, for as hard as her life was, is so beautiful and seems so happy now. I actually got to spend some time with her on my last day, and it was such a moving experience. Of course, I’m writing about it. 🙂 Thank you for taking the time to comment and for the sweet words on my photos. It was so cool to see the elephants just living. What an amazing post! Elephants are my favorite animal and your pictures of the are beautiful! Thank you so much for sharing! Thank you, Angela! I really loved writing it and going through the photos. What a wonderful experience… some great photos! Great pics Diana, hey almost tell the story by themselves. And a ver nice site re-design too! This is seriously by far my favorite of your elephant series. Lovely. Aww, thank you Erica. It is my favorite, too. But, there’s one more AWESOME story left! And, by awesome I mean one of the coolest experiences in my life. 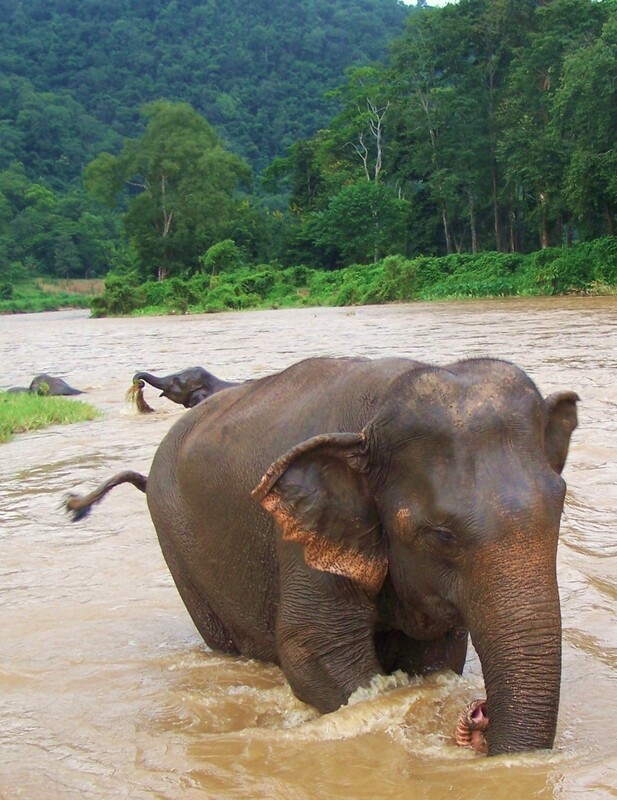 I want to give those elephants a bath–and then a big ol’ hug! Me too!! I cannot wait to go back. These photos are so amazing! I really enjoyed this story. I don’t know how anybody couldn’t just simply adore elephants 🙂 BTW, I love the new looks of your site! 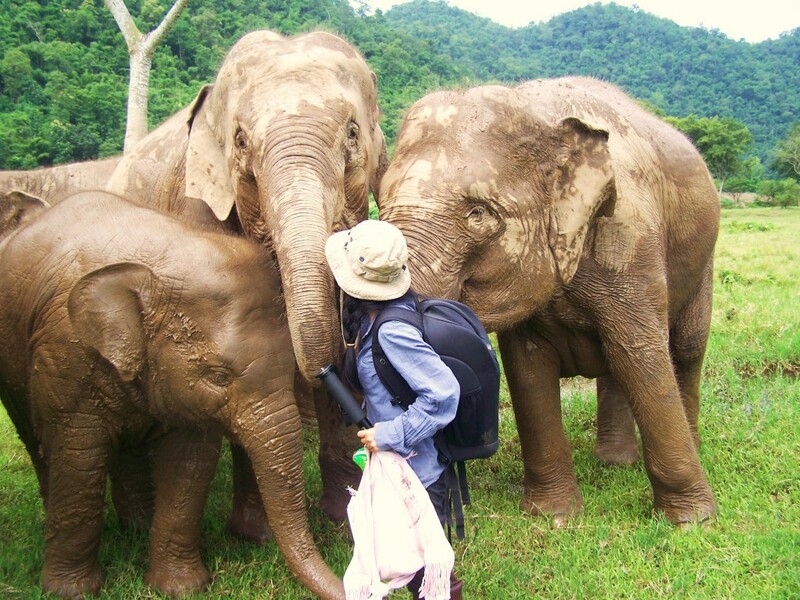 I spent a week at the Elephant Nature Park in September 2009 and as you said it was life changing. It was one of the most awakening experiences of my life. I am so glad you were able to experience the park. I wish more people could have that moment in their lives because it really is one of those things that changes you. Thank you for taking the time to comment, Daina! It really was an amazing experience!! I cannot wait to go back and do it again! Diana, these photos are just stunning. The photo of the injured elephant just breaks my heart, but the ones of the guys playing in the dirt and in the water make me smile. They look so lovable. I can’t imagine what an amazing experience you must have had! Thank you, Emily. The first time I saw Medo with her injuries, it broke my heart. But once I spent time with her, I was overjoyed that she is able to live the rest of her life at Elephant Nature Park and is cared for. Aren’t they cute rolling in the dirt? They looked so happy! Love. Love. Love. Lovely story — even without the pics (they’re not showing on my browser right now, but I’m on a bad connection.) In some ways it’s kind of nice actually, with all the emphasis on the words… I’ve been thinking about this a lot lately – with the pics. Thank you, Margo! I like to write the story and then put in the photos so that way they only add to the story, they aren’t the story. 🙂 I’m glad you enjoyed the post!! These elephants are adorable! I’ve never been a big elephant person, but I kinda want to hug them right now. Fascinating creatures, stunning shots! Thanks for sharing! Looks like a grand adventure. Thank you, Alex!! It was absolutely a grand adventure. One of the best (if not THE best) of my life. They really are awe-inspiring. These photos don’t look real! She is SO beautiful!! I adopted her for a year, too! I promise i will go volunteer in this park! So glad I took the time to read every word of this beautiful post. What an experience you are having, and what beautiful animals. They seem so sweet and fun and loving with each other. I wrote this the first time I was at the park. Seven months later, now I am working for them. Thank you so much for the kind words!! The elephants are quite possibly the most amazing animals on the planet! Oh, wow, Diana, just discovered this post and it made me tear up. Medo IS beautiful. How amazing. I know when we met at TBEX you mentioned you were going there and are there right now and I’m looking forward to reading more of your posts about your volunteering. I went to Thailand last year and I rode an elephant as part of a trek. Unfortunately, I didn’t do my research on riding elephants before leaving. After getting home, I was obsessed with elephants and started reading up about them and learned that my experience was the wrong way to interact with elephants in Thailand. It was quite upsetting for me, actually. The elephant we rode was so cute and interactive and it makes me sad that maybe he was actually miserable and mistreated. I’m continuing to learn more and hope that someday I can get back to Thailand and help the elephants, too. You’re doing a great thing! This is incredible….It brought tears to my eyes! Thank you! It brought tears to my eyes being there, too! Wow. I don’t think you need to be told how fortunate you are to have experienced this. Just reading it gave me goosebumps! No, I know. I am REALLY lucky. ❤ I'm glad you enjoyed the post!